Jingjing makes children smile--and that's why he brings the blessing of happiness wherever he goes. You can see his joy in the charming naivety of his dancing pose and the lovely wave of his black and white fur. As a national treasure and a protected species, pandas are adored by people everywhere. The lotus designs in Jingjing's headdress, which are inspired by the porcelain paintings of the Song Dynasty (A.D.960-1234), symbolize the lush forest and the harmonious relationship between man and nature. Jingjing was chosen to represent our desire to protect nature's gifts--and to preserve the beauty of nature for all generations. 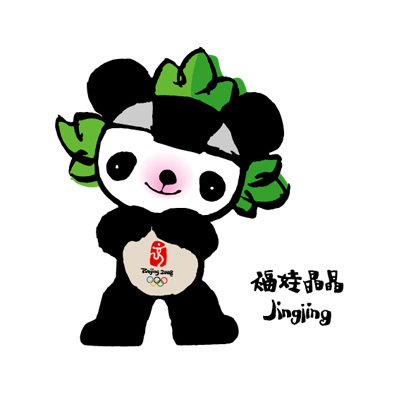 Jingjing is charmingly na?ve and optimistic. He is an athlete noted for strength who represents the black Olympic ring.